To discover Algeria better, reading this travel guide that includes smart advices for Algeria travelers will be a perfect option. When you are in Algeria, the largest country in Africa, the scents of coffee, pine and mimosa will surround you. When you are dazzled with both oriental and the European atmosphere of the country, the stunning sea, the Ottoman palaces or the wind from the Sahara desert will welcome you. Sahara Desert is one of the greatest attractions of Algeria as well as the reputable towns Ghardia and Timimoun or UNESCO’s world heritage site Casbah. The cuisine is also worth tasting and your Algeria trip, as a whole, will leave you unforgettable memories. 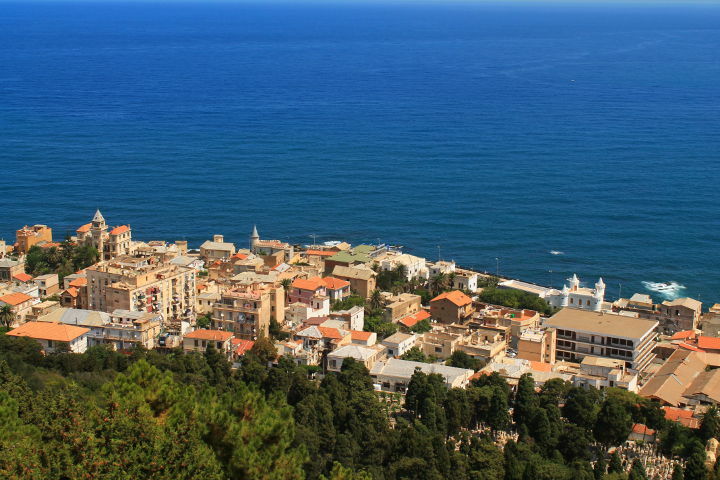 If you are ready to discover this unique country, never hesitate to pack up for dreamlike Algeria. You’ll see that it’s beyond the expectations and it will never make you disappointed. Being the largest country in Africa, Algeria is located in North Africa on the Mediterranean coast and circled with Tunisia in the northeast, Libya in the east, Morocco in the west and the Mediterranean Sea in the north. Before travelling to Algeria, you should check if it requires a visa from your country or not. For more information about the visa policy of Algeria, you can visit the official website of the Algeria Ministry of Foreign Affairs. Algeria is a rich country in point of ancient ruins which are mostly from Roman, Byzantine and Phoenician eras. The most attractive ones are Tipasa ruins, Timgad, Regius, Djemila and Calama. Sahara is undoubtedly the most attractive sight in Algeria covering 85% of Algeria land. When you enter the desert is through the El Kautara Gorges because it offers a breathtaking view. Timimoun town is located as an oasis in Sahara and it is really worth a visit. Being as the chief city of Algerian Tuareg, Tamanrasset is circled with Sahara desert and has a hard climate. However, this city is bestowed with the fertility and apricots, dates, citrus fruits, figs and corn can be grown there. 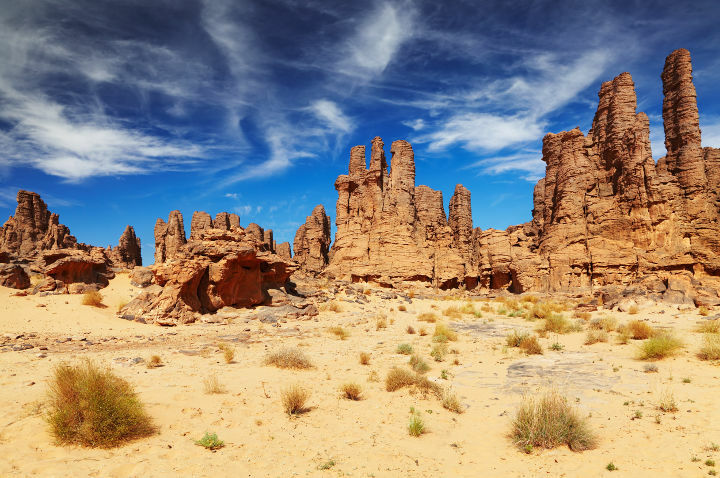 If you like to visit Tamanrasset, you’d better prefer the cooler months. This city will offer you much in the name of Tuareg lifestyle and culture. Casbah is regarded as the historical center of Algeria. This area is UNESCO’s World Heritage Site and its history dates back to Ottoman era. You can enjoy the picturesque narrow streets of this area and visit the Ottoman palaces and mosques. 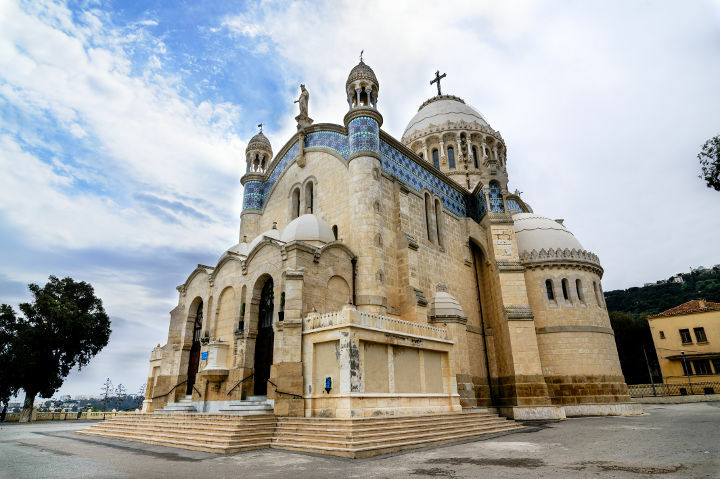 The Neo-Byzantine style Cathedrale Notre Dame d'Afrique is situated on a 125 m cliff overlooking the Bay of Algiers. It went under a restoration for 14 years and then it was inaugurated in 1872. 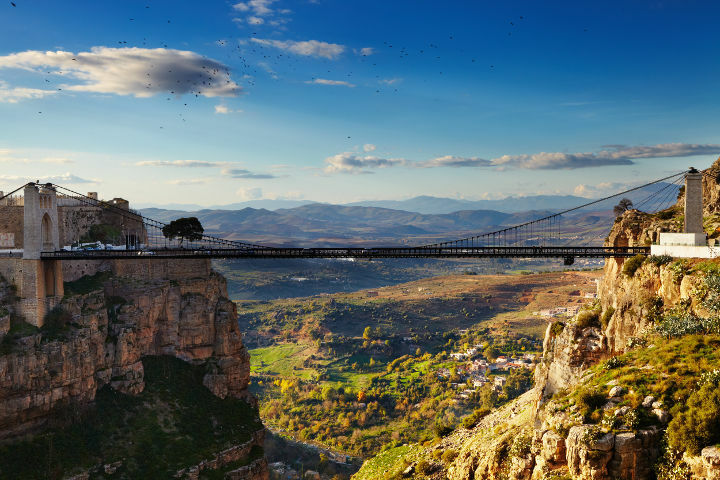 In Constantine, a city of Algeria, you will find fascinating building that are built on high cliffs and many bridges that offer stunning view of the countryside and Rhummel River. Due to the influences of Berbers, Arabs, Turks, Romans, Spanish and of course the French, Algerian cuisine is a great mix of different tastes. Algerian cuisine is mainly based on lamb meat, vegetables and Mediterranean seafood. Just like other Muslim countries, pork consumption is forbidden by Islam. Couscous can be considered as the national dish of Algeria and it is served with meat and vegetables. Kesra is a traditional flatbread and it is consumed in each meal. Another popular dishes are Chakhchoukha and Merguez. Chakhchoukha is generally eaten on festivals and it is especially popular in Aurès region. It is made of small pieces of thin round flatbread and a kind of stew, Marga. Merguez is a spicy lamb sausage dish that comes from the Atlas Mountains. Halwa is the most popular dessert in Algeria and it is especially consumed during Ramadan or in special occasions like weddings or festivals. 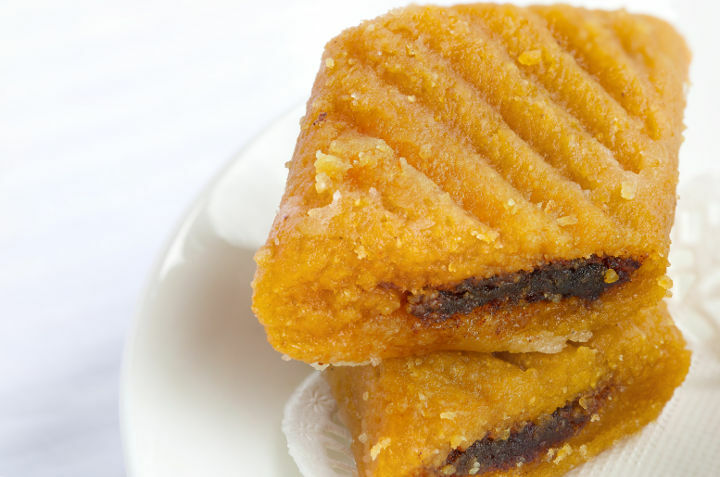 Makroud is also a great taste that you can try while you are in Algeria. It is kind of a dough that is made of semolina and filled with dates or almonds. Turkish coffee is highly consumed accompanying desserts. In the last years, especially the cities of Oran and the capital Algiers have become popular as an event venue for international academic or business events such as congresses, conferences, trade shows or symposiums. Being the largest country in Africa and having a favorable location in the area, Algeria is becoming more and more important for the event organizers.